The Hotel provides its own 24 hour security monitoring and patrolling as well as security contractor Guard Dog Security. Prices are in PNG Kina. The Hotel provides the following 24 hour services: Reception - Currency exchange is at our daily rate. All C/C's are accepted. Cheques can only be accepted by prior arrangement with Management. - Security patrol and monitoring - Laundry Service - Manager on Duty. - Emergency Doctor. A 24 hour emergency Doctor Service is available in the Hotel. 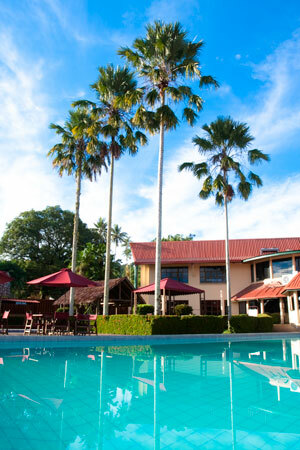 Situated on 9.5 acres in the centre of Lae, The Hotel is extremely private. There are 400 car parking bays in which to park your vehicle. For those who like to maintain their own personal level of fitness the Hotel has many areas in which to walk or run. The Gym is equipped with a free weights, electronic bikes and running platform. Visit our Boutique for a range of handicrafts and gifts. A 23m pool is available for guests use, open every day. A small child's pool is available for toddlers but children must be accompanied by an adult at all times.